The most important characteristic of an eDiary is ease of use for patients. 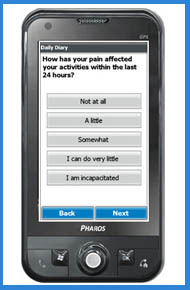 CRF Health offers several eDiary device options to ensure each study team can choose a device that best fits the needs of the study. The most important characteristic of an eDiary is ease of use for patients. We offer several eDiary device options to ensure each study team can choose a device that best fits the needs of the study. The options range from devices that are easy to carry around to devices that have large screens for efficient data entry. By focusing on the patient's experience, we are able to report high eDiary compliance rates from our studies. TrialMax® enables collecting ePRO data efficiently in global clinical studies. Each country is served with an eDiary solution that supports the local languages as well as transmits the patient-reported data to the study database by using the best available local network technology. Our solutions also support complex languages, such as Indian languages and Japanese, and countries with varied network infrastructure, such as Russia and China. This allows smooth deployment of ePRO in global studies.